Figure 1: Bronze Military Merit Medal on war ribbon. Image from author’s archive. The Bronze Military Merit Medal (Bronzene Militärverdienstmedaille), 1890-1911 is not at first glance a very important looking medal. 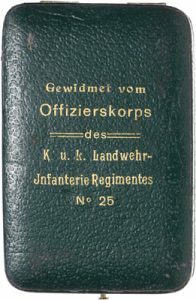 However to the Austrian officer corps and to the empire it was a medal of substantial significance. This can be recognized when one considers that in the order of precedence of Austrian awards it preceded the Gold Bravery Medal and that until the second year of World War I all awards were personally presented by the Emperor. 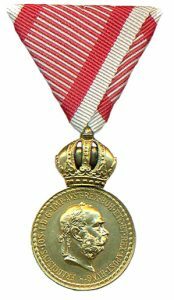 In fact this decoration was roughly the equivalent to the American Distinguished Service Medal in regard to the esteem with which its recipients were held in the empire. What follows is a discussion of this significant award. 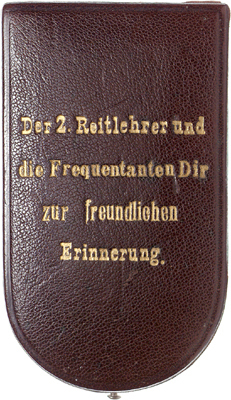 Reason Issued: To recognize extraordinary service in time of war or outstanding service in peace time by officers or military officials of a rank equivalent to an officer. 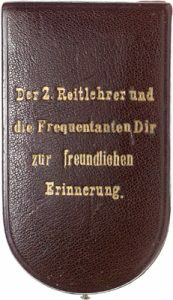 Classes or Types: This decoration was issued in one class and two types. 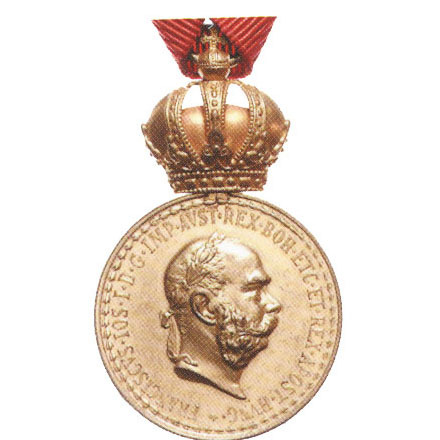 Obverse: A bust of the older Emperor Franz Joseph I in high relief facing to the viewers right. In his hair is a wreath of laurel. Around the bust is inscribed: FRANCISCVS . IOS . I. D. G. IMP. AVST. REX. BOH. ETC. ET. REX. APOST. HVNG *. 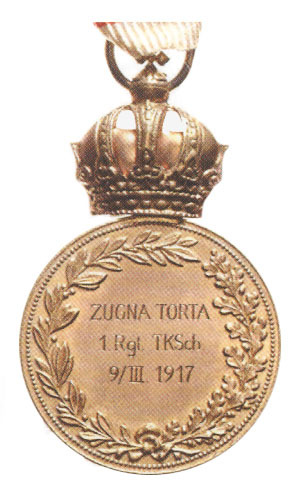 The beginning and end of the inscription is at the bottom of the medal and is separated by a star. 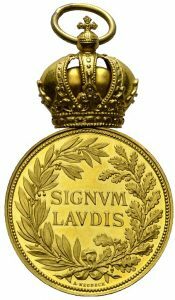 Outside of the inscription along the edge of the medal is a wreath composed of 64 laurel leaves. The attached crown is usually hollow with a gold bonnet inside. The crown is hinged and is moveable. 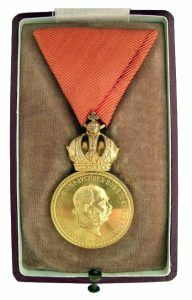 Figure 3: Bronze Military Merit Medal, reverse. Image from author’s archive. Reverse: Inside of a raised rim is a fine beaded line following the circumference of the medal. Inside the beaded ring is a wreath composed of a laurel bough with 30 leaves (left) and an oak bough with 26 leaves (right) which is tied at the bottom with a bow. Within the wreath is inscribed, SIGNVM LAVDIS (A token of esteem). Below the bow is the designers name A. Neudeck (Andreas Neudeck) or A. Scharf (Anton Scharf). The reverse of the crown is fully detailed. 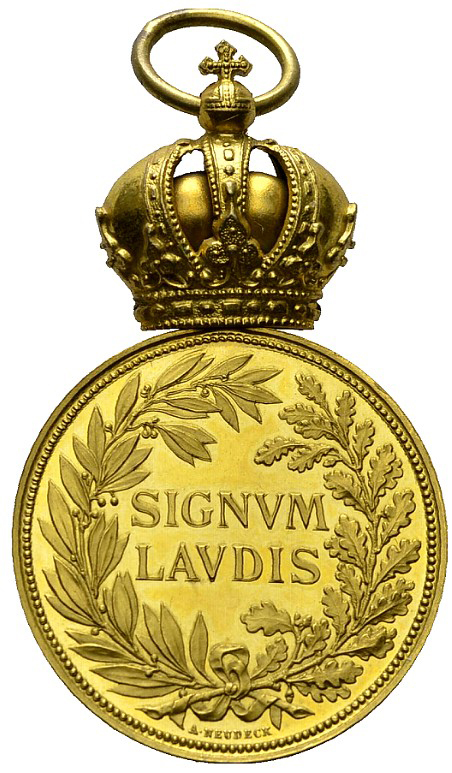 Figure 4: Bronze Military Merit Medal, Type IV, engraved reverse. Image courtesy of Dorotheum . 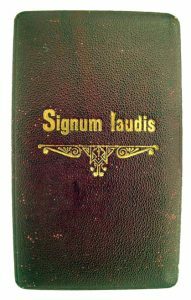 Case: The decoration came in a wide variety of cases, some of which had a presentation inscription engraved on or within them. (Some of the known cases are illustrated below). 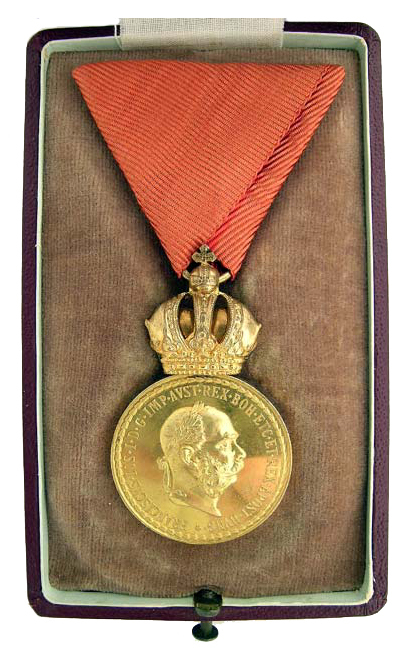 Figure 5: Military Merit Medal Case, from the author’s archive. Figure 6: Military Merit Medal presentation Case, from the author’s archive. Figure 7: Military Merit Medal Case, interior, from the author’s archive. Figure 8: Military Merit Medal presentation Case with inscription on outer lid, Image courtesy of Dorotheum. 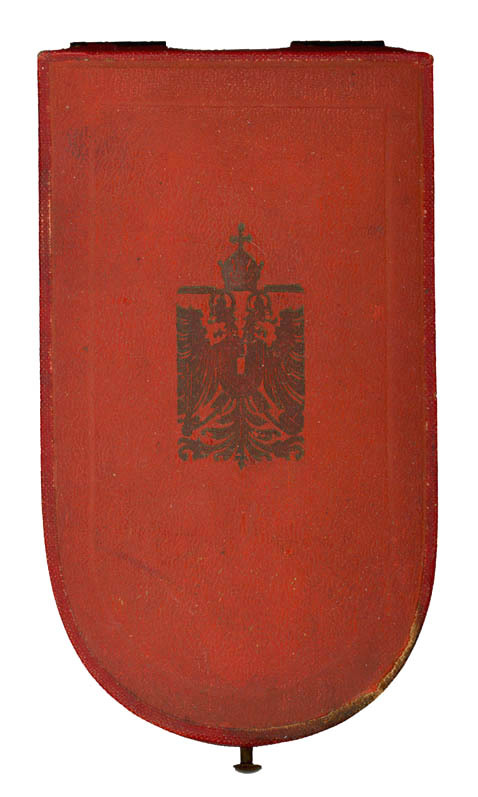 Figure 9: Military Merit Medal presentation Case with inscription on inner lid, Image courtesy of Dorotheum. 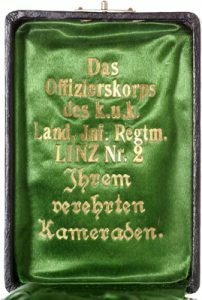 Figure 10: Military Merit Medal Case manufactured by Josef Zimbler, Image from the author’s archive. Ribbon: A 40 mm Red and White laddered ribbon for combatants and a 37.5 mm bright red ribbon for civil recipients and for military recipients in peace time. Figure 11: War Ribbon. Image from the author’s archive. Figure 12: Poppy Red Civil Ribbon . Image from the author’s archive. 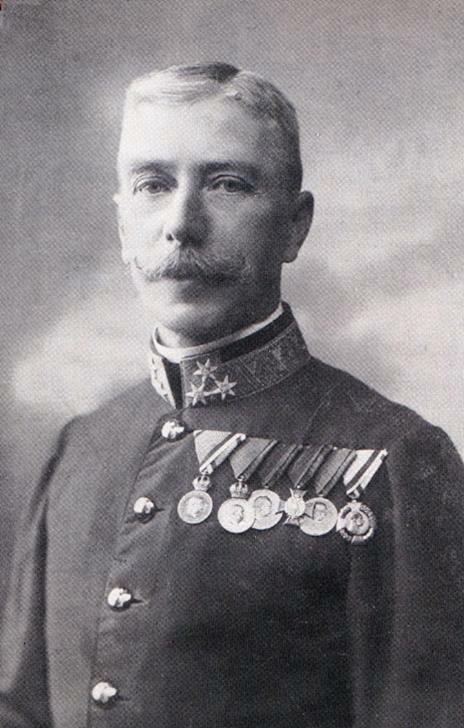 Figure 13: Franz Joseph Knight CHain with Military Merit Medal. Image courtesy of Dorotheum. Figure 14: Military Merit Medal, miniature on civil ribbon. Image form the author’s archive. Figure 15: An Oberst (Colonel) wearing two merit medals, one as awarded in time of war and the other as awarded in peace time. Image form author’s archive.